There is a sacred privilege that comes with being a writer. You have the opportunity to tell stories that can move people—not just to tears, but to action. That is what Jennifer did the other day. Did you read, “What It Really Means to Have Compassion”? Please do. I shared it and tagged a few friends. One of them—the one with the golden hair and heart—said this in response, “What better friend than one who makes you miserably uncomfortable with your comfort?” (<===Click to Tweet). Do you ever avoid reading certain things because you know you will most likely be convicted? Once you are aware then you are responsible to do something. You become miserably uncomfortable with your comfort. It’d be “easier” to put your head in the sand, but then you would be dirty. O God, clean our hearts—a good scrubbing on the inside—so that we gleam with your heart for the world. When I read Radical: Taking Back Your Faith from the American Dream by David Platt and Kisses from Katie: A Story of Relentless Love and Redemption by Katie Davis, I felt uncomfortable. I had heard and now I was responsible to act, somehow. Over hot beverages with dear friends, I tried to articulate the inner struggle that was stirred up from the themes of these books. On one hand I felt guilty for living in America and freely enjoying coffee and conversations in comfort. No hungry belly, horrible disease or persecution threatened my leisurely outing. On the other hand God had allowed me to live here in one of the richest countries in the world, for some reason. These feelings swirled around, deep down—damned up by distraction and emotional overload. I felt stuck, uncertain of how to release life-giving water to those perishing. But the waters kept swirling, threatening to leave me seasick if I did not do something. The internal conflict swelled and I had to let out some water or go under. So I started small—maybe because I am a small town girl. Satan hissed, You are “small time”. Your small change won’t make a difference. But I went forward anyway. The water broke through the barrier and Extension 26 was birthed. Instead of demonstrating contempt for these riches, let’s use them to comfort others. May our conviction lead us to compassion as we extend an arm, a word, an act to give generously. We are not justified by our works but they are an extension of our love for Jesus and His love for all. We have so that we can give. Do you ever feel guilty for living in such a rich country? Do you ever feel bad eating a huge meal, knowing that others are going without? Do you want to make a difference but aren’t sure how? My husband helps curb my guilt by reminding me that we are only responsible to act as God leads. We don’t have to save the world or be all things to all people—Jesus already did that and is that—but we do have the opportunity and privilege to pray, give and advocate as He directs our steps. My steps were directed to the Fair Trade Friday Club, a ministry of Mercy House founded by Kristen Welch. 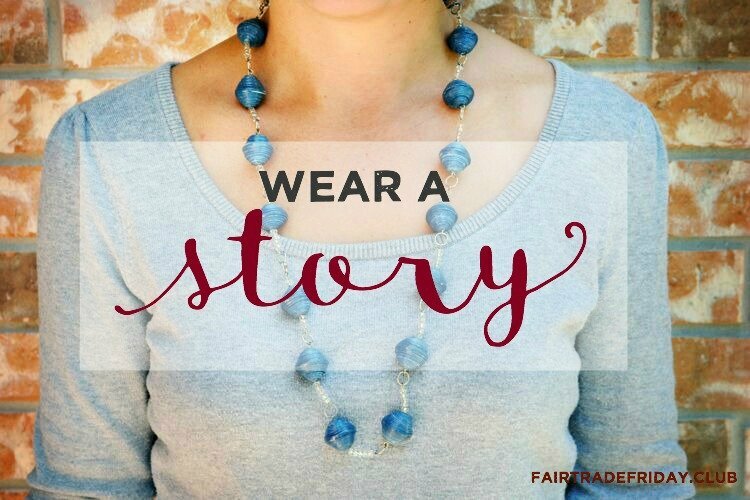 On Monday you saw a sneak peak of the necklace that I received as part of my Fair Trade Friday box. Getting my box of fair trade products was one of the best mail days ever. Knowing that these items are feeding and clothing women, practically and spiritually, made my heart swell with joy. 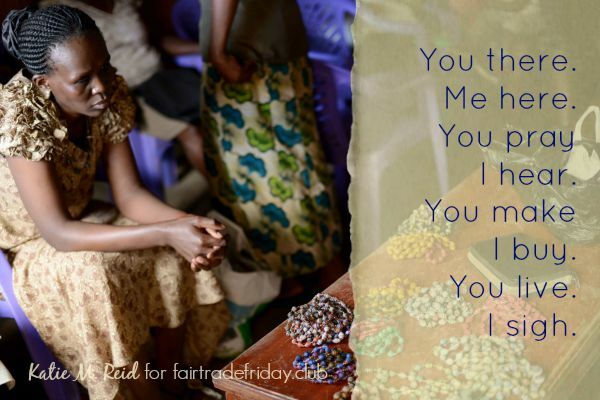 You can also shop for Fair Trade products like the one pictured above. When I saw this shirt I knew I wanted one right away. First of all they are lovely in color, design and message. I would wear this shirt everyday if I could. It is comfy, stylish and a great conversation piece. It reminds me that even our small “yes” can have a big impact as we entrust Him to multiply our offerings. May we empty our full hands so that empty hands can be filled. May we give freely so that she can freely live. May we let go of what holds us back so that we can lift burdens from her back. May we say “yes” to helping and “no” to hurting. May we speak on behalf of the weak. May we wear her handiwork so that in peace she can sleep. May we be moved from tears to action, from fears to compassion. So, what are you waiting for? Join the Fair Trade Friday Club or Earring of the Month Club. If the clubs are full get on the waiting list so that you don’t miss out. I’m thanking you for being a Wound Up Woman who is doing good around the globe. Enter below to win a Love Mercy Bracelet. I will announce the winner over on my Facebook Page on Monday. P.S. 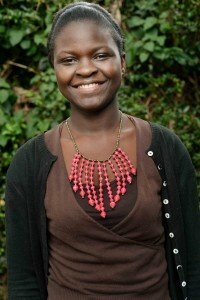 Learn more about Mercy House Kenya and read this moving post by Kristen Welch over on Ann Voskamp’s blog. 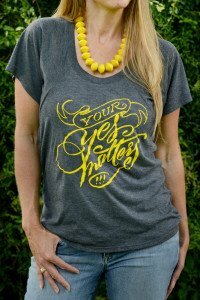 I do pretty much wear my “Your Yes Matters” shirt everyday. 🙂 You’re right .. it’s super comfy, and a great conversation starter! I also love the paper coasters, the earrings, and the paper bowl. So many gorgeous products! Love how you’re using your space to share these stories and ministries. Checking it out now, Katie! Thank you for passing this on! Praise God! I love these words. I understand that 1st world guilt that says, “Why me?” God says, because that is where I put you. I praise God that you are pouring out and pouring in to such a great cause. You are being faithful with God’s gifts. Love you girl.